The official RHCP Twitter account posted this morning with details of new tour dates in Australia and New Zealand! 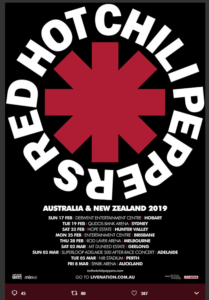 Dates for the Australia and New Zealand RHCP Tour! Thanks to my sisterwife, Hamish and Sarah for helping out with info.